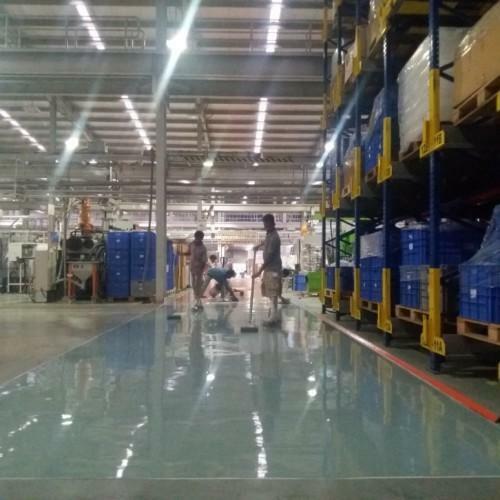 DIBHALITE-SLSR-23 is Epoxy based solvent free, pigmented, high solids Self Levelling Screeding Coating consumed for protective decorative coating for concrete surface. Being Epoxy based systems it resists Abrasion Chemicals like Acids, Alkali, few solvents and even to saturated solutions like bleach, sugar solution, urea etc. One coat of DIBHALITE FXC on Concrete surface. Apply one coat of primer as suitable for the surface. Mix the ratio as cited below and lay the floor with specific tools and trowel designed.